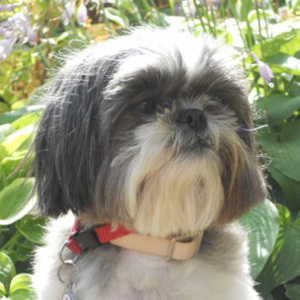 Faith is a small Shih Tzu, weighing in at just seven and a half pounds. She is a rescue dog who was adopted by her handler Jane at two and a half years old. Faith initially had some fears – she would hide behind Jane when meeting new people. Soon after on walks, however, Faith saw that everyone she met was kind and wanted to pet her. Finally she began to realize that people of any age were her friends. All Jane has to say now is “friends”, and Faith’s tail goes up in the shape of a question mark and begins to wag. She has learned to trust, and now regards everyone she meets as her new best friend. Since joining North Star Therapy Animals, Jane & Faith have visited in many different places – hospitals, nursing homes, schools, libraries, and memory care facilities. Jane finds reward in seeing the smiles on the faces of the people they visit. When people ask why Jane & Faith do what they do, she tells them it’s a win/win for everyone involved, and that “Faith is a little girl with a warm heart”. Faith isn’t just a hero to the people she visits. When Jane slipped on some ice, suffered a concussion and was knocked out, Faith licked Jane’s face until she woke up. She enjoys playing with her stuffed squeaky toys and hanging out with Jane so she can have her belly rubbed as she sleeps upside down.